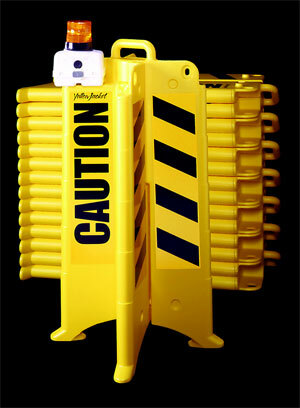 YellowJacket is a new free-standing safety device designed to set up quickly and warn people away from hazards. They are also a way to mark a temporary machine or construction site. Two Yellow Jackets fold flat for storage to only nine inches thick. They are available in quantities to form multiple configurations. It is designed to make cordoning of work zones easier and more productive.